Fedor Holz is crushing the summer of 2016, but he says this will be his last full WSOP. He's barely past "rookie status" at the World Series of Poker and still three weeks away from turning 23 years old, but one of poker's biggest stars is already looking to change things up next year. 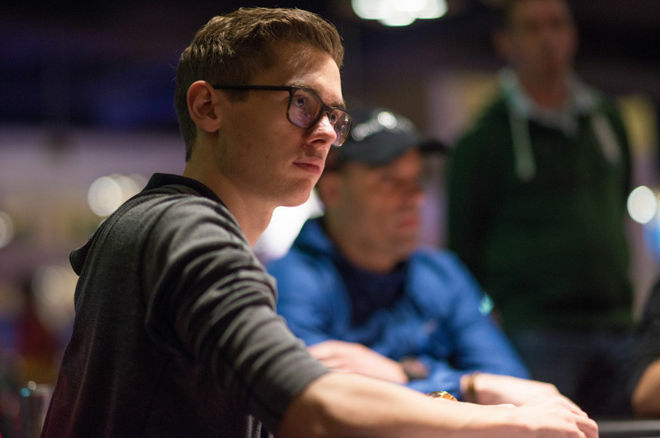 Fedor Holz, a player with over $13.5 million in live tournament earnings, is playing his second WSOP and the grueling grind of the summer might have already taken a massive toll on the young juggernaut. "The WSOP has been very interesting, with lots of different emotions," Holz said. "I've won a lot of money, and I've lost a lot of money. I feel like it's going to be my last, 100 percent, from the beginning to end, World Series of Poker." It's no secret that the WSOP is not only the richest series of poker tournaments in the world, but also the most draining and demanding stretch of high-stakes action anyone could ever wish for. "It's been very, very intense," Holz continued, letting on that the Vegas grind might be getting the best of him. Holz recorded his first WSOP cash just 12 months ago, and coming into Saturday, July 9, he's got nine total for just shy of $700,000 in earnings. Last year Holz came close to making the WSOP Main Event final table, but finished in 25th place. That said, it's been the other events in Las Vegas where he's mostly made his mark. This summer alone, Holz has won a staggering $5.3 million in non-WSOP events ,including a second-place finish in the $300,000 Super High Roller Bowl for $3.5 million. "The beginning [of the summer] was just insane," Holz said. "The $300K chopping with Rainer Kempe and then the $25K and another $25K. I think that’s a once-in-a-lifetime heater." The very day after we spoke to Holz, he wasted no time chopping another $50,000 High Roller at Aria for $407,310 putting him just $340,000 shy of a $10 million year — and it's only the start of July. Just six players in poker's rich history have cashed for north of $10 million in a single year, and Holz is on his way to do it without winning the WSOP Main Event or the Big One for One Drop. "To be honest, there are just too many situations in which I don't enjoy it 100 percent," Holz said. "Poker gives me freedom, and I don't want to give that up. I feel like in Vegas, I give too much of it up. I've decided that I'm not going to do it like this anymore. I made some mistakes this year by making side bets, and I will also not do that anymore. "I have bets against people depending on how much we cash in no-limit hold'em tournaments, without saying all the details." The bets are big enough to make someone like Holz, who has had enough success to sit back and enjoy things rather than grind day in and day out, play anything and everything he can. Although he wouldn't go into specifics on his bets, seeing how much he is grinding sheds some light on how big these bets must be. Earlier this summer it became clear that Holz took Stephen Chidwick versus Jason Mercier in a $100,000 per-bracelet bet, and that has cost him quite a bit considering he also bet against Mercier to win a bracelet. It's possible that losing those bets has made Holz even more motivated to win his personal wagers, but that also creates additional strain and stress on a player. "The bet I have is for all WSOP hold'em events, so I need to be there for every $1,500 event, every $1,000 event, and I find myself sitting there from the beginning," he said. "Because of that, you play tournaments different then how you would usually play them. I would probably play most of them anyway, but right after the $300K I felt like I wanted a break, but I also felt like I couldn’t. Once you feel like you want to, but you can't, then that's a very bad situation." Holz guarantees that next year he won't be spending the entire seven-week stretch in Las Vegas, but he will be back with a different approach and mindset. "I don't see many things in Las Vegas that I would do if I'm here and don't play much," Holz said. "I think I would do it differently — skip some of it, or come here and fly to Mexico for one or two weeks before coming back. I felt like right in the middle, around week four, I was feeling ill and exhausted because it's all very draining. But it's worth it, I guess." As Holz has an outstanding résumé with over $13.5 million in live tournament earnings at age 22, one might think that winning a WSOP gold bracelet would mean more than the financial reward, but the young German remains even keeled about raking in the extra dough. "The good thing is, when you win a bracelet you also win a lot of money," he said. "Those two come together. They both mean a lot, and you can't say that one means more than the other. I play for both. It's a challenge and it's nice to be rewarded with more than just money. It's a memory, the bracelet, and just like the SCOOP watch I won, I would never wear it I don't even like the watch, but it's a great memory. Even though it might not be fully dissevering, it's a very nice reward." For someone with a huge amount of tournament experience, cash games can sometimes be daunting, but Holz has dabbled in some high-stakes action as well, which could be adding to the toll the summer is taking on him. He said he's played some $500/$1,000 at the Aria. "There was one really good cash game," Holz said, before going on to discuss an unknown player that was driving the game. "It was $500/$1,000, and I was down three buy-ins, but it was a great game. It was a lot of fun, too. I would play this every day, and we played really long sessions. Unfortunately 'he' left, but it was super fun. One time he texted us that he wanted to play at 10 in the morning, and we all showed up and then got another message saying, 'I went parachuting, I'll be there in 90 minutes.' That was hilarious! "It's like a playground in Las Vegas, and that's what I like about it," Holz said. "There's always something going on, and even the fact that most of the hotels are connected is something I really enjoy. It's a fun place, but there are too many things here that are unnatural to me. I have to be not myself a lot of the time and that's very draining. At some point you just want to relax, and when I'm home these things are more natural. There are more places when I can naturally relax. In Vegas, I just go out to play, and it's always a grind." On Saturday, Holz played Day 2 of the WSOP's $111,111 High Roller for One Drop where he was one of the big stacks for most of the day. That's an event where there is nearly $5 million for the winner. "Right now, I feel real good," Holz said. "I was a little down a week ago and I wasn't enjoying it too much, but a fter four or five tournaments now I realized that there's only this $111K and the Main Event. That's it, and I'm super pumped right now for that."